Black Bear Rally : First ever overall victory for Sébastien Clark and Yanick Marin ! 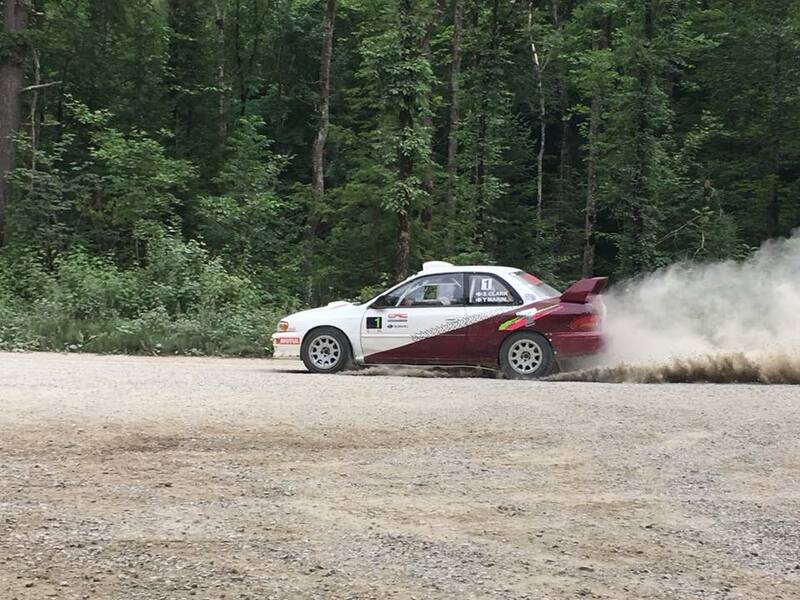 July 15, 2018.- The fourth round of the 2018 Eastern Canadian Rally Championship (ECRC), the Black Bear Rally, was for the first time contested on roads in the Catchacoma region, north of Peterborough. This change of scenery turned out to be favourable for the Quebec duo comprised of Sébastien Clark and Yanick Marin, in their Subaru WRX STI. This was the first overall victory for the team, who are still gaining experience in the sport of performance rallying. Leaving the familiar Bancroft roads that are a little further north and traditionally used for the Rally of the Tall Pines (the final round of the ECRC season), the Black Bear Rally is an staple event in Ontario, held in the heart of the summer. Well-known American drivers have participated in the past, including Travis Pastrana who competed in this event as his very first Canadian rally. This year, a date change less than one month prior to the event has somewhat dampened the popularity of the rally, but the battle for victory was still intense. Ironically, the fight for the win played out between a 4-wheel drive Open class car and its 2-wheel drive homologated equivalent ! Swapping the lead throughout the six competitive stages of the day, the duos consisting of Patrick and Daniel Cyr (2-wheel drive Toyota GT86) and Sébastien Clark/Yanick Marin were eventually separated by one minute and two seconds at the finish. Everything played out in the very last 10.86km stage of the rally, with advantage going to Clark/Marin. Ontario driver Laurens Wit, co-driven by American Philip Barnes in a Subaru WRX STI, completed the overall podium, adding to their victory in Production 4WD Class. They finished forty-six seconds ahead of the next 2-wheel drive team made of up Ontarians Gary Sutherland and Bruce Leonard (Ford Focus). The Top 6 was rounded out by Curtis Antoine/Liam Schrurr (Subaru WRX STI, 4WD Production Class) and by Zoltan Kovacs/David Koiter, winners of Production 2-wheel drive in their Chrysler Neon. The next round of the ECRC, the only event of the season held in the Maritime provinces, will be the Ledwidge Lookoff Rally, in Dartmouth, Nova Scotia. It will take place on August 11 and 12 and will mark the start of the second half of the championship.